In 1967, Geraldine Norman was tasked with leading an editorial collaboration between the London Times and Sotheby’s. The project galvanized the conceptualization of art as an investment asset. Few people active in the art world today have heard of the Times-Sotheby Index. Those who have are most likely veteran art dealers or retired auction staff. Web results primarily consist of library entries for Norman’s 1971 book on the project. 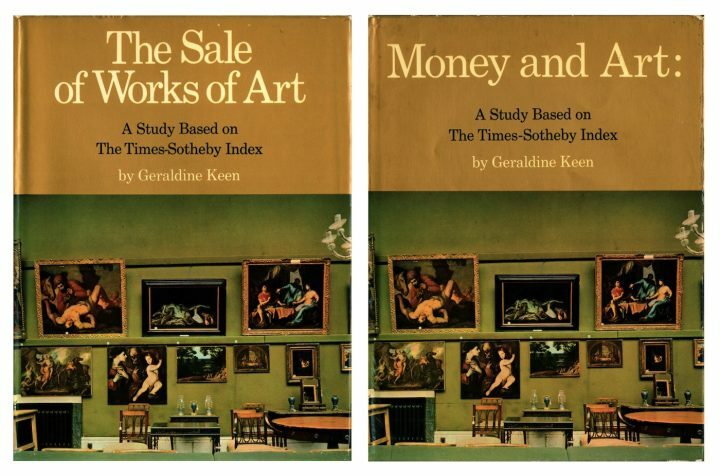 Published regularly in the Times between 1967–1971, the Times-Sotheby Index purported to chart the changing prices of art sold at auction. Each feature centered on a single movement or department (Impressionism, English silver, Chinese ceramics, etc.) and were accompanied by charts that illustrated sales prices from the early 1950s to the present. 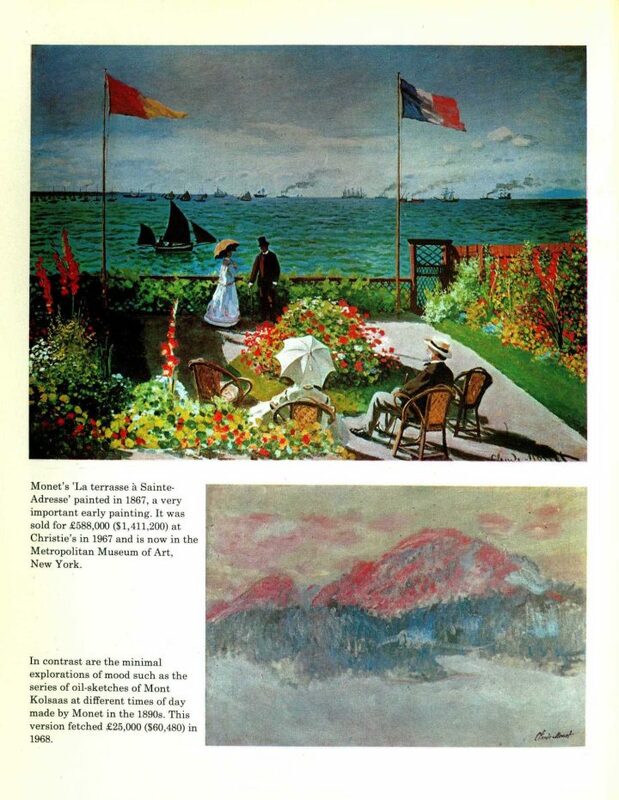 The first index, published on November 25, 1967, includes seven prominent graphs dedicated to Impressionism. 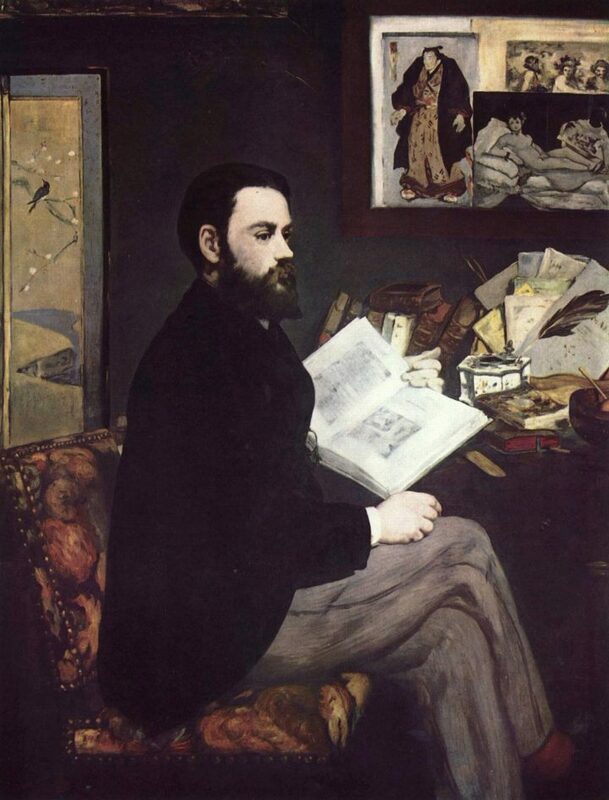 Six charted the prices paid for specific artists since 1950–52: Renoir (“up 405%”), Fantin-Latour (“up 780%”), Monet (“up 1,100%”), Sisley (“up 1,150%”), Boudin (“up 835%”), Pissarro (“up 845%”). The seventh graph includes three indices, the value of Impressionist paintings, US share prices, and UK share prices — the former vastly outpacing the latter. The message was clear: Art is a hot commodity, and its sale value can and should be conceived in much the same way as a stock on the Dow Jones or FTSE 100. 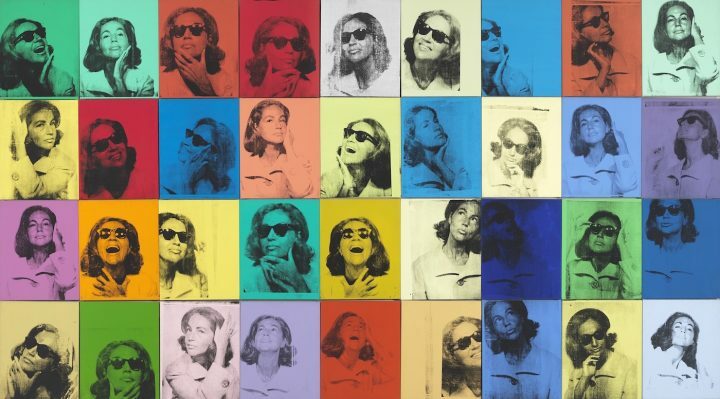 The market for contemporary art has grown exponentially since the 1960s. It’s now commonplace to describe the intricacies of an artist’s particular “resale value,” or “collector base.” Innumerable artworks reside out of sight within heavily secured free ports, where their owners avoid custom duties. The press routinely report record sales, rehashing features on the best-selling artists and publishing listicles on the world’s most expensive works. Companies such as Artnet, Collectrium, Artprice, and ArtRank sell their data and insights on sales and trends. Speculation is the norm. 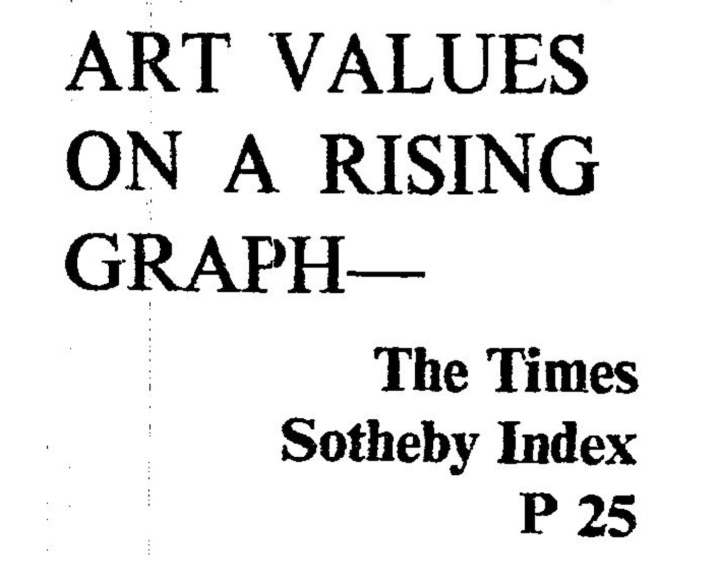 However, in 1967, the Times-Sotheby Index’s brazenly analytic conception of art’s value was, with a few exceptions, unprecedented and highly radical. Perhaps it was the graphs that did it. They gave these tendentious little essays the trustworthy look of the Times financial page. They objectified the hitherto dicey idea of art investment. They made it seem hard-headed and realistic to own art. Together, Clark and Wilson landed a spectacular PR coup in convincing the Times to collaborate on the feature. The name alone guaranteed a tranche of regular free press for Sotheby’s and the association with the Times instantly bestowed authority on the index’s findings. Though they conceived it, neither Wilson nor Clark actually brought the index to life. That responsibility fell squarely on Geraldine Norman’s shoulders. The project presented an obvious methodological conundrum. Unlike gold or oil, art is not a singular commodity. Every piece is unique, and an artist’s oeuvre will always be comprised of works judged to be of a comparatively higher or lower quality. 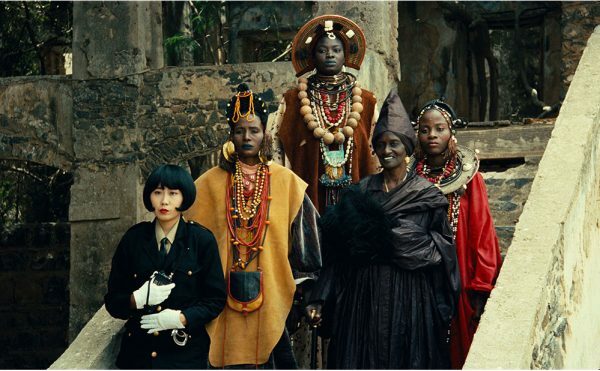 Aesthetic judgements, regardless of trends or received wisdom, are subjective. Condition, provenance, and size are just a few of the factors that have a bearing on how an artwork is appraised. After that Naudet loses no time, but disposes in a similar manner of nine or ten paintings by the same man during the course of the year. Vanity gets mingled with the hope of gain, the prices go up, the pictures get regularly quoted, so that when Naudet returns to see his amateur, the latter, instead of returning the picture, buys another one for eight thousand francs. And the prices continue to go up, and painting degenerates into something shady, a kind of gold mine situated on the heights of Montmartre, promoted by a number of bankers, and around which there is a constant battle of bank notes. Norman was also not the first to demonstrably equate auction sales to stock values. In 1961, art collector Richard H. Rush published Art as an Investment, a beginner’s guide to collecting. Each chapter included graphs dedicated to the changing sale value of different schools of art. Despite its title and graphics, Rush’s book is not a full-throated endorsement of art as a commodity asset. The collector’s guide champions studiousness, patience, and above all, a life-long commitment and passion for art. The important collectors of paintings usually do not sell. They look upon their paintings as their treasure and a major love of their lives to which of course a price tag can be attached but which usually need not be turned into cash during their lifetimes. It is enough to know that the value is there and that it can be passed on to heirs or public institutions as their contributions to the culture of society. The opposition to art’s evolving commodity status directly impacted the production of Norman’s 1971 book. The journalist’s UK publishers rejected her proposed title, Art and Money: A Study Based on the Times-Sotheby Index, opting for the slightly more sober The Sale of Works of Art instead. Only US editions bore Norman’s intended title. As part of her critique, Glueck observed that Norman had not identified the percentage of works that were “bought-in” below their reserve price, the undisclosed minimum bid at which a consignor is willing to sell their work. If the auctioneer fails to attract bids higher than the reserve, then the work is unsold (i.e. bought-in or “passed”). In lieu of real bids, auctioneers will conjure imaginary ones in order to surpass the reserve price (a practice known as “chandelier bidding”). At the time, neither Christie’s nor Sotheby’s publicly disclosed the percentage of bought-in lots, thereby maintaining the illusion of unrelenting demand. Glueck also chided the fact that the Times promoted Norman to sale-room correspondent amidst her ongoing work with the index. “[I] wonder how Christie’s, Sotheby’s London rival, likes that?” the critic reasoned. Glueck’s criticism of Norman’s conflict of interest, though fair, proved to be misplaced. 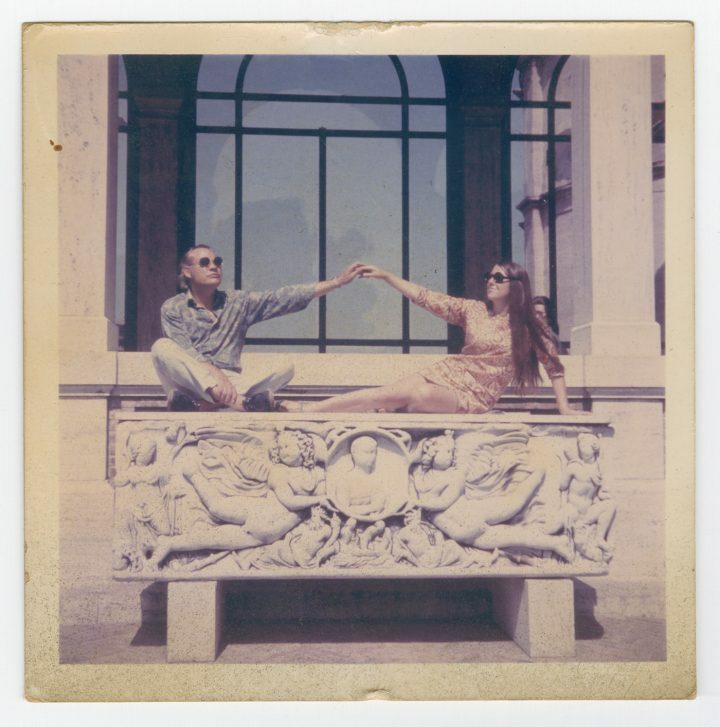 By 1971 — the very year Art and Money went to print — Norman’s professional relationship with Wilson had evaporated, and she was held in equal contempt by Peter Chance, the chairman of Christie’s. Ironically, it was Norman’s determination to shed light on auction reserves that marked the death knell of the index. 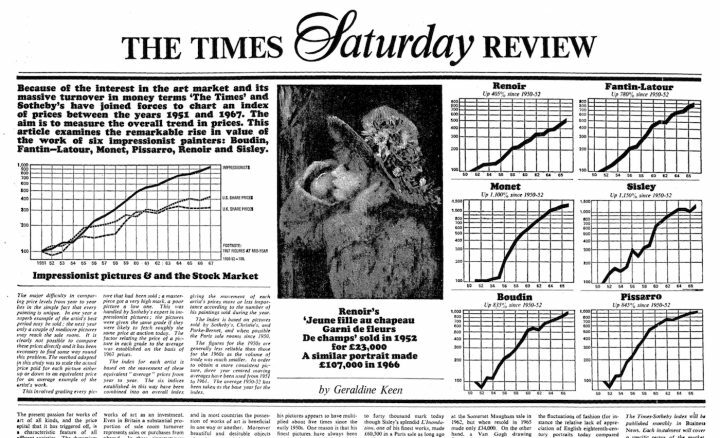 The standard narrative is that Wilson scrapped the Times-Sotheby Index after auction sales began to dip. Indeed, the last feature to be published, headlining “English silver’s lacklustre market,” could hardly be described as a press coup for Sotheby’s. Norman’s feature had documented a few price declines over the years (“No rags to riches story for English porcelain,” November 1968; “Fall in Chinese ceramics,” September 1970), but the truth of its demise is far more complex. It’s true that we didn’t volunteer information on bought-in lots, if we weren’t asked about them, and the standard procedure was that the total given would be the knock-down and include bought in lots. Geraldine, once she was confident of her position, decided this was not good enough; she wanted, certainly when it came to important sales, every price in the catalogue and whether the work was sold and if so who the buyer was. With this information she could work out the percentage sold and bought in. It was strange that no other journalist had ever asked for such basic information before. Peter Wilson never forgave me for that. He felt that I had let the side down, that it was disloyal. 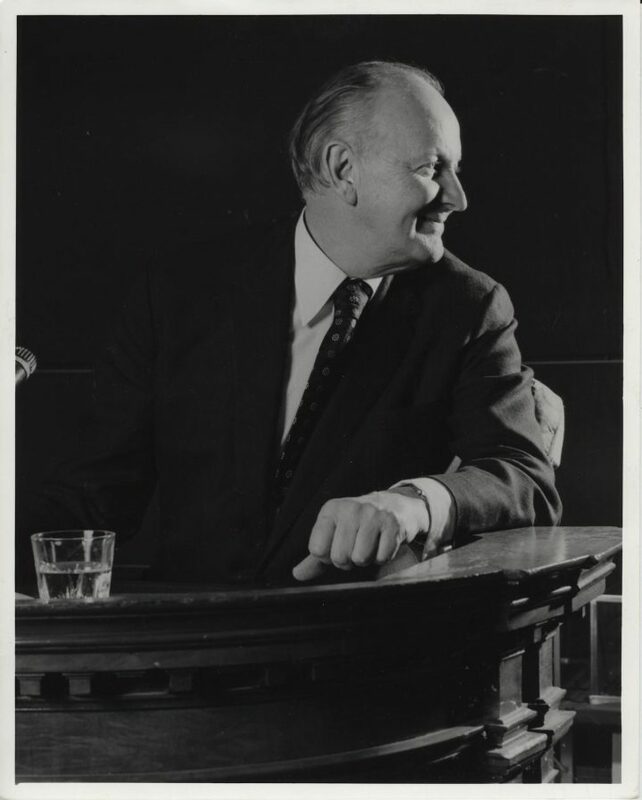 He first said that he was going to close the doors of Sotheby’s to me, that I was never to be allowed into Sotheby’s again, but he actually couldn’t do that because I was the Sale-room Correspondent of the Times [laughs]. When we met, he used to shake with anger. On July 16, 1970, the Times published Norman’s article, “Secrecy in the London auction houses.” Eight months later, the paper published her final Times-Sotheby report. Norman’s July article exposed the use of fake names, but also outlined the defense for such secrecy. Auctioneers maintain that if bidders knew reserve prices, they would be disinclined to bid beyond them. Works known to have been bought-in might be perceived as undesirable and can therefore be harder to resell. Yet, such secrecy runs entirely counter to the ethos of the public auction. 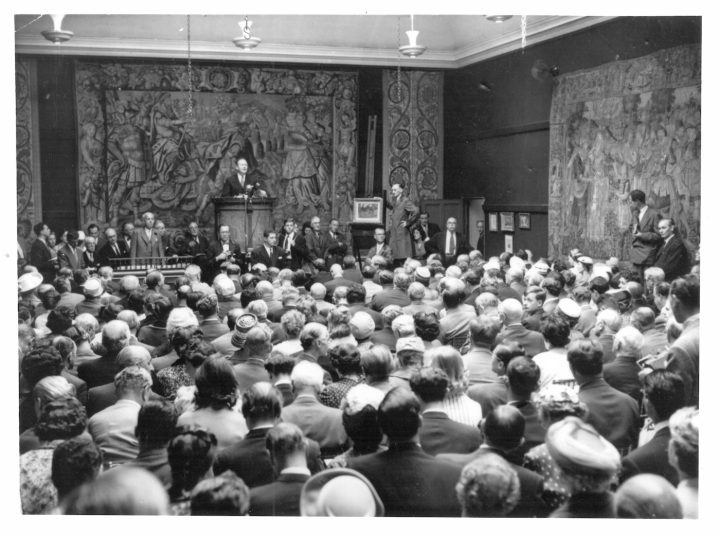 “The auction rooms have profited greatly from the public and open nature of their transactions,” wrote Norman. “Their secrecy over unsold lots is thus something of a contradiction.” In the face of increasing scrutiny, the auction houses gradually amended their policies. By 1975, both companies excluded bought-in lots from their sale lists. “Few journalists can claim, as [Norman] can, to have forced two world famous firms to change their hallowed practices by sheer persistence and strength of mind,” wrote Herbert. I remember our first meeting. I saw this small girl get out of a battered German bubble car, dressed — I hope she will not think me ungallant — rather like one of Augustus John’s gypsies, with wisps of hair flying in all directions. 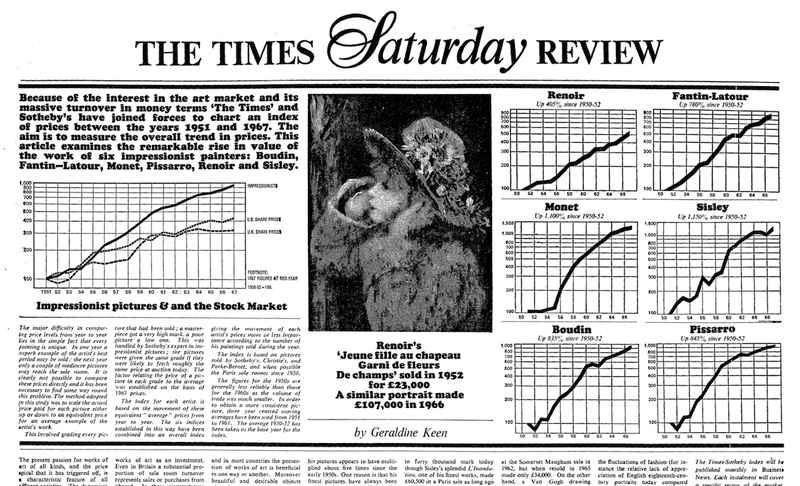 By the time Art and Money was published, the findings of the Times-Sotheby Index had been syndicated in publications around the world, including the New York Times, Süddeutsche Zeitung, and Connaissance des Arts. Two years later, collectors Robert and Ethel Scull sold works from their contemporary art collection at Sotheby’s Parke-Bernet for a staggering profit, definitively shifting the market’s focus to contemporary art. “I think it was the starting point because it was so blatant,” Norman remarked. Picasso up 3 points, Renoir down 2. It didn’t strike me that it was having an immediate impact on the art market. It changed people’s minds and way of thinking, but it took a matter of years to work its way through. It was only ten years later that I began to realize that it had actually made a sea change in buyers. It was a gradual thing.